Krewella in Montreal or Quebec City? Inform me about the next events for Krewella. Enroll yourself to our priority waiting list for Krewella to be alerted when new tickets are available. Filling this form doesn't engage you to any purchase. American electro act Krewella will be performing at the Telus Theatre, in Montreal, on October 24th, 2013. 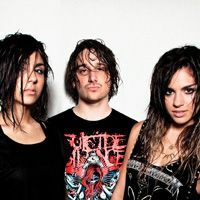 With their first full-length just released, Krewella is going places lately. Their mix of dubstep, house music and drum'n'bass is sure to make the Telus Theatre rave.